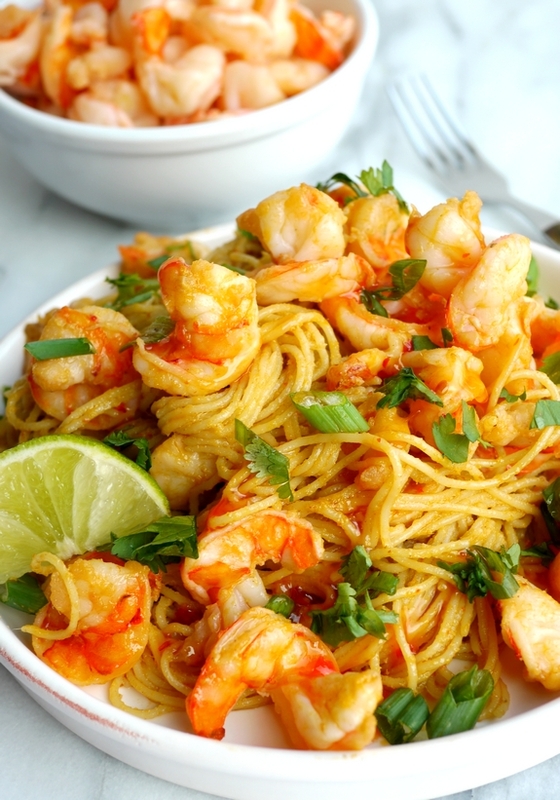 This Spicy Thai Shrimp Pasta is so simple to make you just might serve it twice in one week (I know I have). 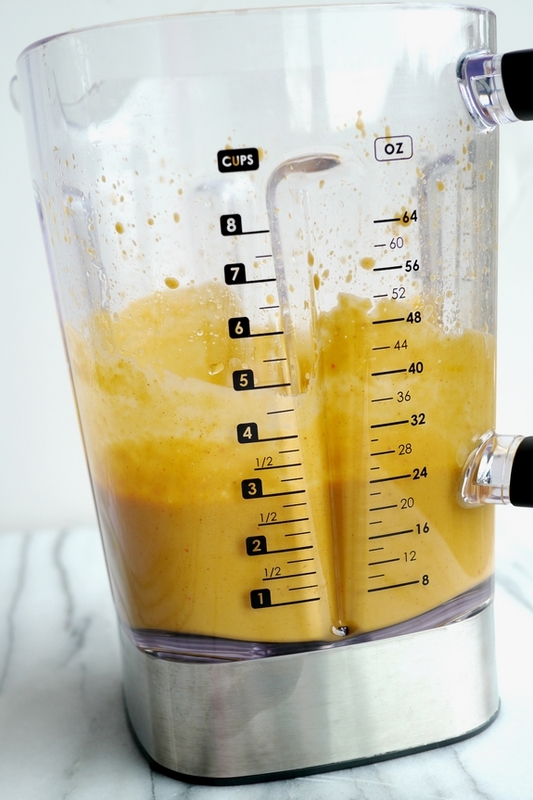 The sauce comes together easily in the blender and is packed with flavor. Don’t worry about having leftovers, they reheat perfectly. I have one son who would happily dine on shrimp for every meal and another son who is allergic to all shellfish. Needless to say I cook a lot of different dinners to satisfy everyone’s needs. The struggle is real! Luckily, this dish reheats nicely so it can be served again and again. It’s all about the silver linings right? It also means lunches will be over the top the week you make it. Everyone at the office is going to be a little jealous when they see what you’re eating. And I know I’ve said before but we have an affection for Thai food over here. This Slow Cooker Thai Pork comes to mind as well as this Thai Soup. I can never seem to get enough. Three of us in the Noble Pig house prefer spicy cuisine and Thai food doesn’t disappoint in that realm. The ingredients for Thai food dishes are mainstream now and not hard to find. Believe me, if I can pick them up in my regular grocery, here, in somewhat rural Oregon, you likely have a FANTASTIC chance of getting a hold of them too. I decided to use serrano peppers in this dish instead of Thai chiles. They have a nice, smooth heat and are easy to find in the produce department. Once you start using serrano peppers they might become your new favorite heat source for adding spice to your dishes. Try them in homemade salsa if you can. I think I like them better than jalapenos. 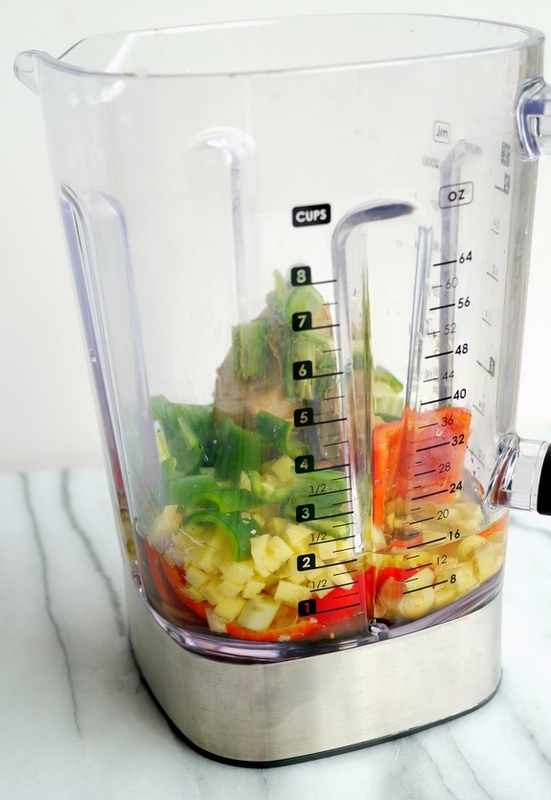 Give the sauce ingredients a rough chop and add them to a blender. Just puree until very smooth. 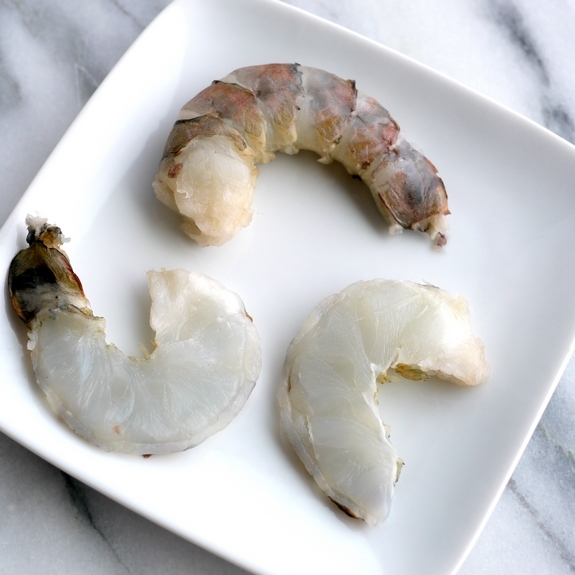 You’ll want to use extra large shrimp or prawns for this recipe and slice them in half lengthwise. You will end up with a whole beautiful tray like this! 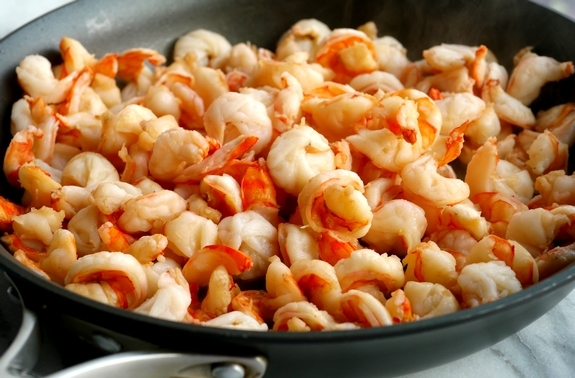 The shrimp cooks up in minutes in a very large saute pan. Could this be any more delicious looking? Chopped cilantro and green onion are the perfect addition to top off your dish. Serve with a lime wedge for an extra burst of flavor and Sweet Red Chili Sauce is a must for a final drizzle. I hope you get to make this soon, it’s so amazing. 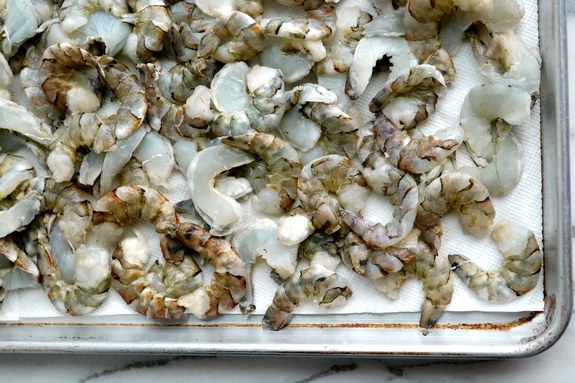 There are so many amazing ways to enjoy shrimp. I’m giving this Citrus Shrimp and Avocado Salad a big thumbs up. These Pineapple Teriyaki Shrimp Foil Packets sound amazing. 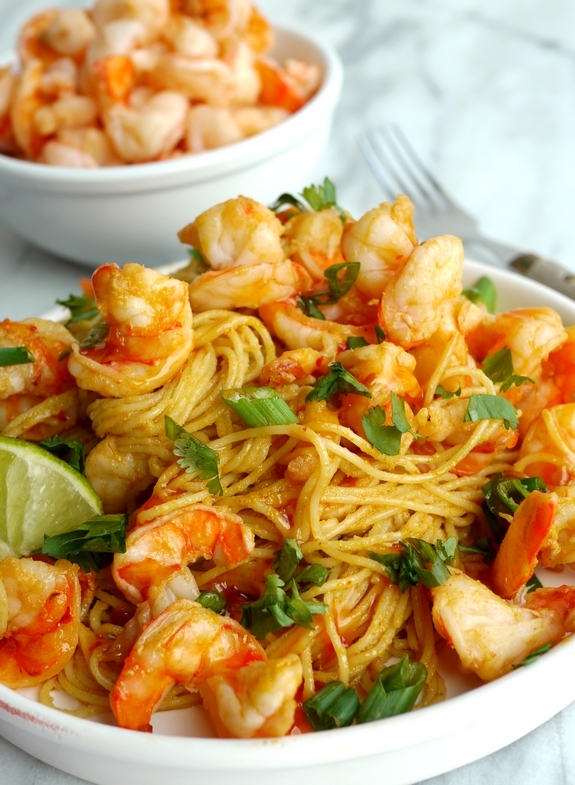 I definitely can’t wait to make this Skillet Chipotle Shrimp dinner. Kielbasa and Shrimp Fried Rice is also on my must make list. Two years ago I posted this Buttermilk Lemon Scented Cake Loaves recipe. It’s so good. Three years ago Buttermilk Pancake Batter Onion Rings (and video) changed the way I make onion years. Four years ago Jambalaya with Shrimp and Ham made my weekday meals easier. Five years ago this Quickie Vinaigrette made salads a lot easier. Six years ago Spicy Chicken Thighs with Apricots and Olives made me love Mediterranean food. Add all ingredients for the sauce into the bowl of a blender. Puree until completely smooth. Set aside. Garnish with sliced green onion and drizzle each serving with Sweet Red Chili Sauce (it's a must). Note: I also suggest serving with extra lime wedges and even red pepper flakes are a delicious addition. *Serrano peppers add a nice, smooth heat to this dish. I like to seed and devein three of them and leave the fourth one intact, removing the stem, but leaving the seeds and veins. This gives the dish its spicy kick. I always suggest wearing gloves when working with spicy peppers. Oh, goodness – this looks phenomenal! This sounds soooo yummy! 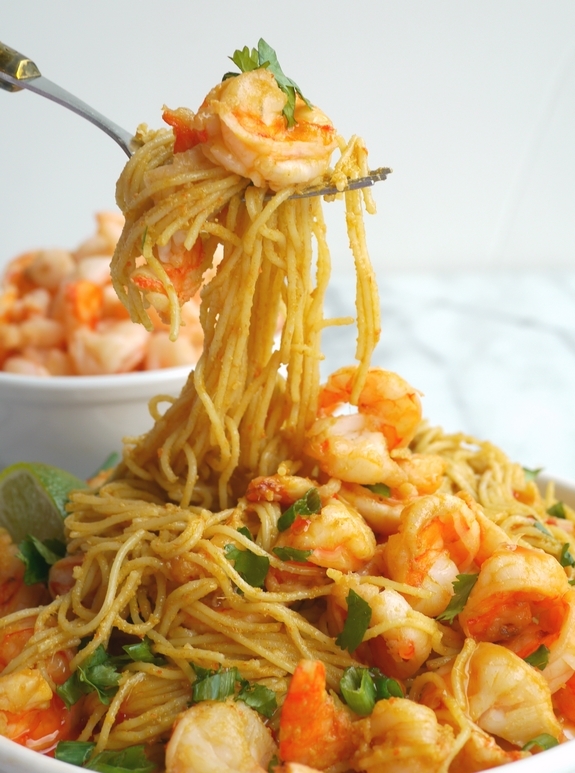 I love shrimp AND pasta, Win win! Oh, does this look good! I love the ingredients and big flavor! Can’t wait to try it! I could eat shrimp every day and be perfectly happy. I could also eat pasta every day and never complain. To me, this is the perfect dish. This pasta sounds AMAZING. My husband goes bonkers over all shellfish dishes, so I have a feeling he’s going to adore this one, too! Oh my goodness this looks amazing, Cathy! It’s a beauty of a pasta dish and the flavors sound great together! mmm every time I think of Spicy Thai food I think of our last trip to Hawaii and it makes me want to get into the kitchen asap! This looks amazing! 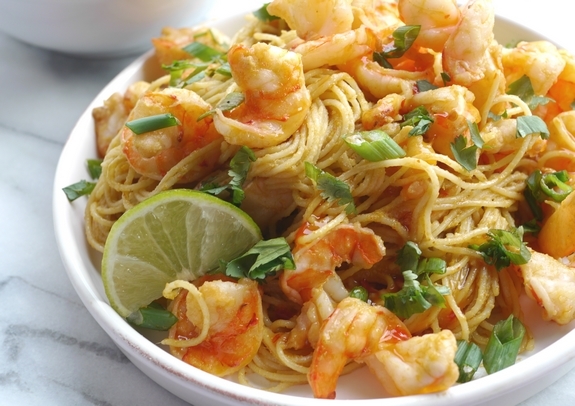 Both shrimp and Thai flavors are on my “favorites” list. This pasta sounds like it would satisfy every craving! 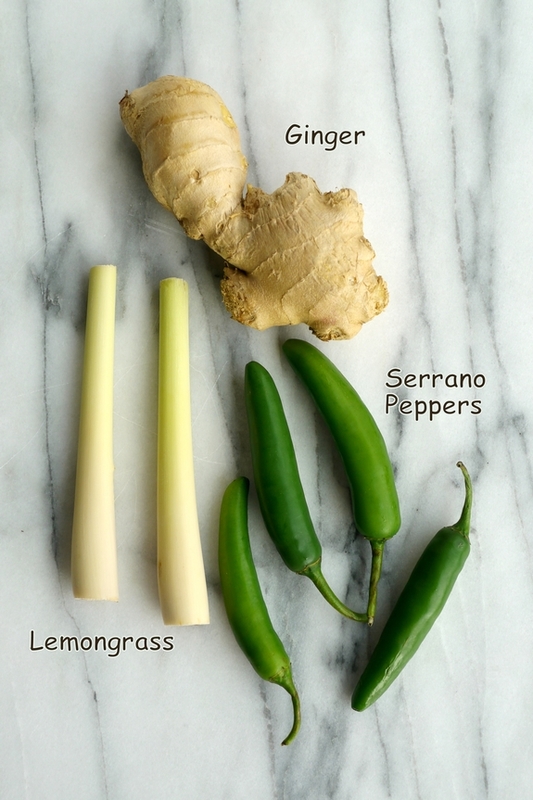 I have difficulty finding fresh lemongrass in my area, but can readily find the minced in a tube. Could you please suggest an estimate on about how many teaspoons/Tablespoons 3 stalks may equal? Thank you! I would start with 3 tablespoons and taste. You can always add more. Does not need to be exact. This is fabulous. I made it last night following your instructions exactly (except I did not split the shrimp) and it was delicious and a hit with everyone Followed it with a cooling salad of greens, cucumber, tomato and avocado. It was a great meal. 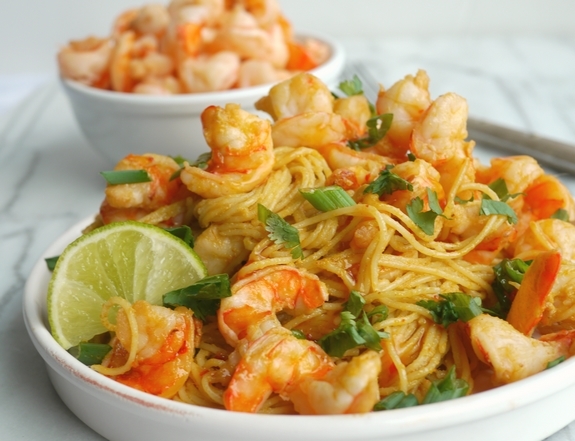 It’s a snowy weekend here, and I was all prepared to try your Thai Shrimp and Pasta recipe – I had to substitute the 1/4cup fish sauce with chicken broth which I had on hand – it worked. The fresh cut limes are a must and the perfect finish for this dish. Thank you so much!! I would love the recipe for the sweet red thai sauce! !